Amazon Fresh comes to the UK?? It’s been widely reported in the media that Amazon have taken on a former Tesco warehouse on the outskirts of London. But with no announcement forthcoming their plans reamin rather mysterious. 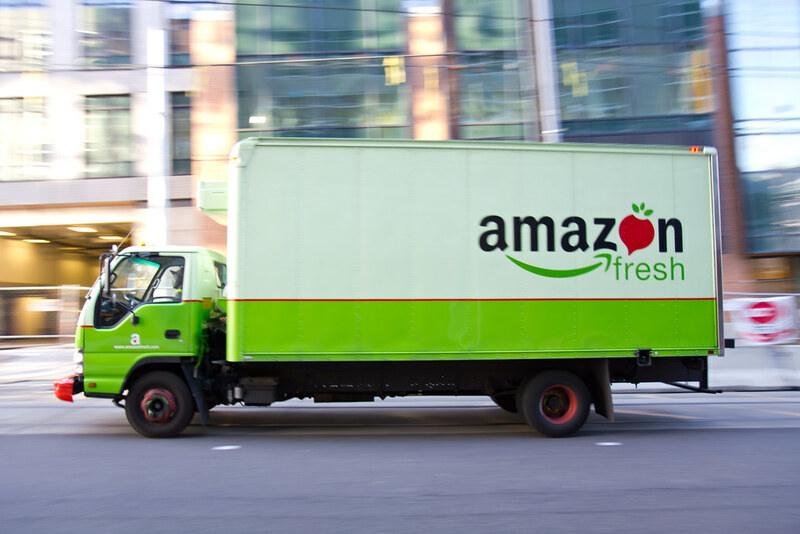 Are they be opening a branch of Amazon Fresh in London to go with their Seattle, New York & San Fransico operations? What effect will it have on Ocado? Will it be a good way for independent food producers to find a route to a (large) market? Are Amazon the new Tesco? In June & July 2015 marumarket carried out the UK Veg Box Survey with 1864 responders and produced a detailed report into consumer attitudes towards veg boxes. The purpose of this market research was to assess the state of UK consumers and their attitudes to ordering fresh fruit & vegetables on line. The thing consumers most like about using a veg box delivery service. Consumers preferred ways of paying. How important it is for consumers to receive recipe suggestions with their veg boxes. The landscape of our supermarkets is changing fast. Lidl, Aldi & Waitrose are the only ones gaining market share. The middle-ground is being swallowed up. Consumers are turning their backs on mediocrity. They want (perceived) high quality produce & service. Or else they want budget and are happy to sacrifice the quality of service. The mediocre middle are bricking themselves. But these aren’t 2 different groups of consumers. Waitrose is usually within 500m of a Lidl, Aldi (or both). It’s the same consumers that use both these shops. So where does that leave your independent business? Will you strive to give your customers better service and better quality produce? Or will you concentrate on competing with Tesco’s prices? When you make a post on your Facebook page, not all of your followers see all of your posts in their time-line. The more engagement you get in your posts, the more Facebook spreads your next posts. So your aim for every post you write should be to get as many interactions as possible. Please think of this EVERY time you post something on facebook. And if we can help you with anything then please get in touch. In 2012 I had what I thought was a brilliant business idea. An online shop and home delivery service on behalf of independent grocery shops in my home-town of Beverley, East Yorkshire. 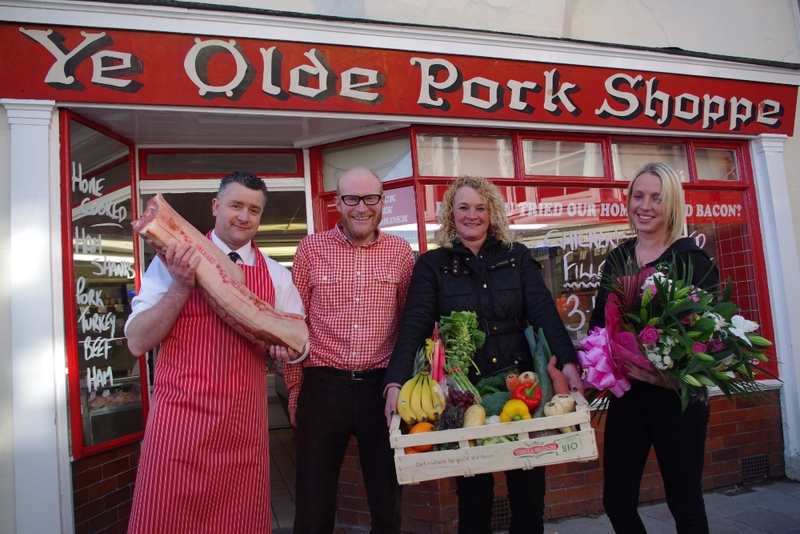 I opened for business in January 2013 and delivered on behalf of the local greengrocer, butcher, fishmonger & bakery. A few other shops joined later. It started well and I got some great publicity. 18 months later though and I still wasn’t making enough money to earn a living. I was making steady progress so the decision to call it a day was a very difficult one. It may have progressed to be a successful business but with a young family I didn’t have enough resources/money/investment to keep going without any income. So in May 2014 I closed the van doors and did my last deliveries and changed the focus of the business to help independent shops improve their on-line presence. “So why am I selling website services to local shops if my business didn’t work?” I hear you wonder. Selling groceries solely on-line is a niche business. Too niche to grow the business to the size I wanted to grow it to. And I didn’t have the investment Ocado have got. As an additional source of revenue for an existing business it is not to be sniffed at. I operated in a rural area which meant delivery times were long. I needed to be doing 3 deliveries per hour to break-even. I was obsessed with only delivering the evenings as that’s when the shops are closed. I also only delivered in 2-hour windows. Using longer windows is much more efficient. If you already deliver then you can tie any extra on-line orders in with your existing delivery rounds so you won’t have this problem. There was a slight conflict of interests with my suppliers. I wanted to sell to customers online, but they would rather take orders directly. If you operate within your own brand of shop then you don’t mind where you sell, as long as you sell. If I wasn’t happy with one of my suppliers then I had to change them. That’s normal with any business, but I was very restricted by physical location. I was collecting fresh produce daily from 8 different shops. If 1 shop was located a significant distance away then it didn’t make it worthwhile to work with them. Not a problem for you as you’re delivering your own produce. I didn’t fully benefit from my on-line marketing. I would spend time and money promoting my produce. I was also very open about where my produce came from. Many customers still preferred to shop in-store, even if they’d got an email or seen an update from marumarket which prompted them to shop. The on-line marketing side of my business worked very well – just not always for my benefit. You’ll benifit from on-line marketing whether it’s in-store or on-line. The margins were very tight. I was an extra layer in the cake from supplier to customer. This meant that to price match with my supplying shops I had to operate on very tight margins. Or I had to more expensive than them. That would have given customers less incentive to shop with me. I also had to charge for delivery to earn my moeny. If you’re operating with greater margins then you may be able to absorb the delivery costs. All of that said, It’s not a totally crazy idea. There’s a company in London call hubbub who operate an identical business model to the one I was using. They seem to be making good progress. A chap in Leeds delivers on behalf of the market stalls at Leeds Markets. He’s called market delivered and seems to be doing a good job. I hope they do well because I think the service is a great idea and a refreshing change from the soulless supermarkets. On the positive side, the average order size was significantly more than I expected it would be and my service was very valuable to my regular customers. I got some great PR (both in the local & national media) and made the finals of a national competition for start-up businesses. So in conclusion, I think operating a home delivery service and on-line shop can, in the right circumstances, be very worthwhile within an existing business but not as a standalone business. That said, an online shop isn’t the right choice for every business but at least make sure you have a website, facebook page and are doing email marketing. Those 3 things are very cost-effective. Whatever size your business is you’ll see a worthwhile return on these activities for sure. Here’s a video I made when I was running the delivery service….. If I can help you set-up a website or improve your marketing then give me a call on 07985 525740 or send me an email at john@marumarket.co.uk. It get you interested in what’s going on in your business – The emails you send out must be authentic so it gets you thinking about what interests your customers. The results are measurable – You can see who opens your emails, who clicks on them, what time they do it all. If you have an online shop you can even track how much money you made from a particular email. You can send them anytime – You can easily schedule your emails to be sent at whatever time you choose. You can send different offers to different people – Imagine you want to send a voucher to all your customers who haven’t ordered in the last 2 months. How would you do that offline? With email marketing it’s as easy as 123. You can reach everyone you want – Everyone has an email account. Not everyone are on social sites like facebook, twitter and LinkedIn. Don’t believe us? OK so we’ve got a vested interest but look at all these other people say…. If you need help with setting up email marketing then please drop me an email at john@marumarket.co.uk or call me on 07985 525740. The future of the grocery industry?? Look at the purple line on this graph. 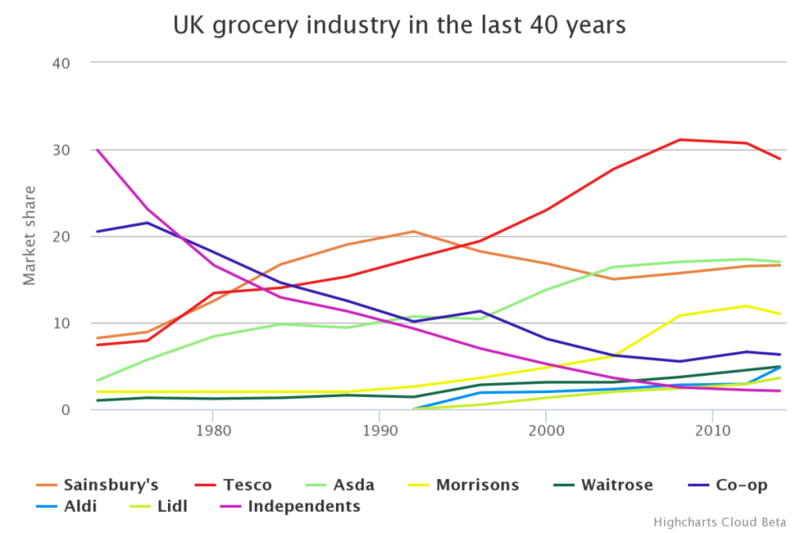 It’s very sad to see as it represents the market share of independent grocery stores. But as the red line (Tesco) has reached a peak, lets hope that the purple one has reached a trough and can start climbing again. As consumer trends change, businesses quickly adapt to meet these new demands. Tesco with it’s clubcard and now we’re seeing a steady rise of the no-frills supermarkets like Aldi and Lidl. But judging from this graph one sector has been left well behind. Too many independent businesses haven’t adapted their service to meet the new demands from consumers and I don’t understand why. Standing still is going backwards as other businesses overtake you. Here are some things which I don’t understand about independent businesses. Not opening at convenient times. Even today I walked past a butcher’s shop in a market town which closed at 12.30pm on a Saturday. Why would any business do that?????? Can someone please explain to me as I have no idea. Because that’s the way it’s always been? Meanwhile Tesco was 200m away and open ’til 10pm. Now, I’m not saying that the butcher can match them completely but doing a half day on what should be their busiest day is beyond my comprehension. Not working together. To go back to the example above – there was a green grocer a few doors down from the butcher. They were open. But if the butcher is closed it affect the trade of their neighbours doesn’t it?? If a (potential) customer knows they can’t buy meat on a Saturday afternoon then they go somewhere else (the supermarket) and the greengrocer also loses out. Not adapting to modern trends. The internet is a very powerful tool. It gives everyone a voice. Whether that’s to advertise (very cheaply), express opinions or to sell online. Any business who doesn’t embrace technology is making a huge mistake. Fight back against soulless retail. Your produce is far better than the big boys and people in your community will support you if you give them enough reason to. Don’t let them beat you.